New footage to emerge out of a children’s festival in the Gaza Strip shows play-acting Palestinian kids urging each other to “die as martyrs” and “blow up their enemies,” and includes mock presentations of them capturing Israeli soldiers and running through what appears to be a tunnel. A video of the events, part of the eighth annual “Childhood Festival” by the Islamic Association in Khan Younis in April, was uploaded to the internet this week, and was made available by the Middle East Media Research Institute. Others show young boys clasping toy assault rifles as they strike poses in formation and run through what appears to be a tunnel. Children are also shown “capturing” an Israeli soldier and throwing rocks at Israeli policemen. The setting appears to be Jerusalem’s Temple Mount, with boys dressed as ultra-Orthodox Jews seen praying the background. 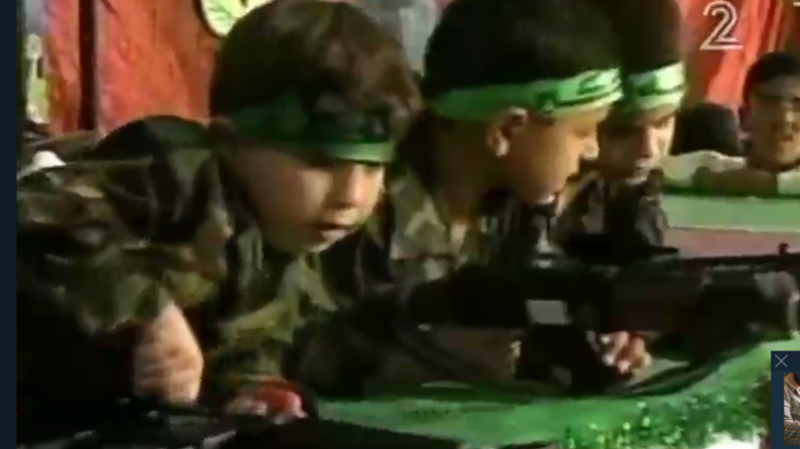 A previous video from the festival which was broadcast by Channel 2 in late April showed children brandishing toy knives and machine guns as they performed a play simulating violence against Israelis. The Daily Mail later reported that a British pro-Palestinian charity supported by UK Labour Party leader Jeremy Corbyn funded the festival. The Mail said that the charity Interpal, formally known as the Palestinian Relief and Development Fund, donated £6,800 (approx. $10,000) to the event. The event was broadcast on a Hamas television channel dedicated to culture, available in Gaza and the West Bank, according to Channel 2 news. In the next scene, a boy dressed as a masked Palestinian sniper shoots a soldier and frees the prisoner from Israel. “Rejoice! the sniper has arrived!” the upbeat music plays during the scene. Ofir Gendelman, the Arab media spokesperson at the Prime Minister’s Office on Sunday compared the play to the propaganda of the Islamic State. “When Palestinians send their kids to act in this school play no wonder their kids committ [sic] attacks when they’re older” Gendelman tweeted. Negative portrayals of Jews and Israelis in official Palestinian media and school textbooks have long been a concern to Israeli officials who claim the content amounts to incitement. Israeli politicians have demanded that the Palestinian Authority crack down on anti-Israel and anti-Semitic rhetoric in official broadcasts, arguing it has inspired many young Palestinians to carry out attacks against Israelis.